Students at Halau Ku Mana New Century Public Charter School gathered yesterday for a pule, where they discussed the day's events and prayed. The eight trailers just below the Hawaii Nature Center on Makiki Heights Drive will be the new permanent home for Halau Ku Mana New Century Public Charter School. To donate money, supplies or time to help Halau Ku Mana New Century Public Charter School, contact Micky Huihui at 988-8995 or go to www.halaukumana.org. Principal Keola Nakanishi spent the last year securing a 30-year lease for the 5-acre property from the state, and the school will have its grand opening for its new campus on July 28. Two of the trailers on the lot are new and were purchased by the school, while the other six were donated. They are being used as temporary classrooms and offices until the school can raise enough money to build permanent buildings. "We really needed a home," Nakanishi said. "The kids' No. 1 wish was having a permanent, or long-term, home." Because charter schools do not receive facilities from the state, Halau Ku Mana has moved several times since it opened in 2001. Charter schools -- public schools with a charter from the state to operate with more autonomy -- have their own school boards and offer alternatives to traditional schools. 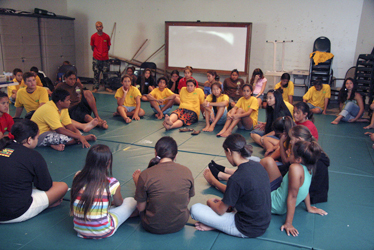 The school serves 90 students ages 11-18, 90 percent of them native Hawaiians. For the last three years, it has been at Paradise Park. Before that, it was at the Atherton YMCA and the Kamakakuolani Center for Hawaiian Studies at UH-Manoa. "Now we can really have a place to call home," said junior Kaleiali'i Baldwin. "We don't have to take time out of our education to move." While securing the permanent campus has been a victory for the school, there are still a lot of obstacles ahead. 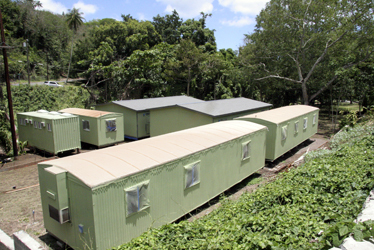 These trailers below the Hawaii Nature Center on Makiki Heights Drive will be the new permanent home for Halau Ku Mana New Century Public Charter School. Nakanishi and his staff have to pack up everything and vacate Paradise Park by June 30, then get the new site ready to open its doors by the first day of school on July 28. A contractor is installing walkways, railings, and ramps next week. The donated trailers need to be refurbished and refurnished. Nakanishi also hopes to get some planting done before school starts. "We're under the gun," he said. "We go day and night and it seems not to be enough." He encouraged the community to help the school by either donating time or money. According to Nakanishi, the new location has an estimated total cost of $1 million. The school is about $175,000 short. Unless they can raise the money soon, Nakanishi said, they are going to have to go without a kitchen and halau, or main assembly room, for a while. But Nakanishi still wants people to know that, "despite the funding inequities, we're a successful school." Halau Ku Mana is a Hawaiian culture-based school that focuses on learning through projects and experiences. The school will have graduation next Saturday at Kaimuki High School for 15 seniors, its largest graduating class, Nakanishi said.